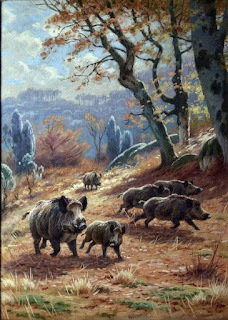 Georges-Frédéric Rötig was a French artist born in 1873 who painted many kinds of animals, including lions, deer, and pheasants. 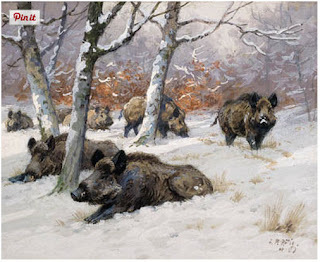 But he especially enjoyed portraying wild boars. 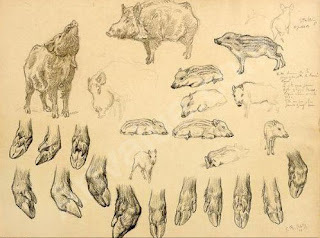 He sketched extensively in various media from living and dead specimens, using gouache, oil, and pencil. Here are some studies in oil. It's a good idea when painting a living animal to start several poses. That way when they move from one to another, you can switch to the one you're seeing at a given moment. 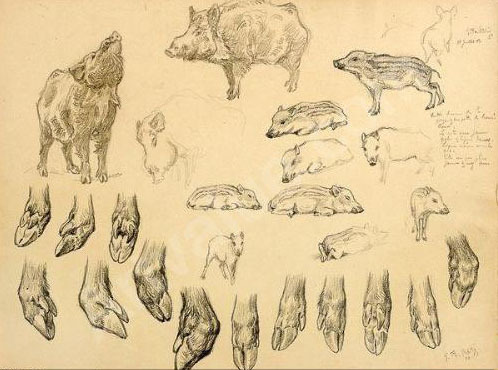 With all these studies at hand for reference, Rötig could compose his paintings and put the boars in any position. He studied with Jules Lefebvre, Benjamin Constant, and Jean-Paul Laurens. He showed in the Salon, winning various prizes including the Rosa Bonheur Prize in 1913. Rötig died in 1961. 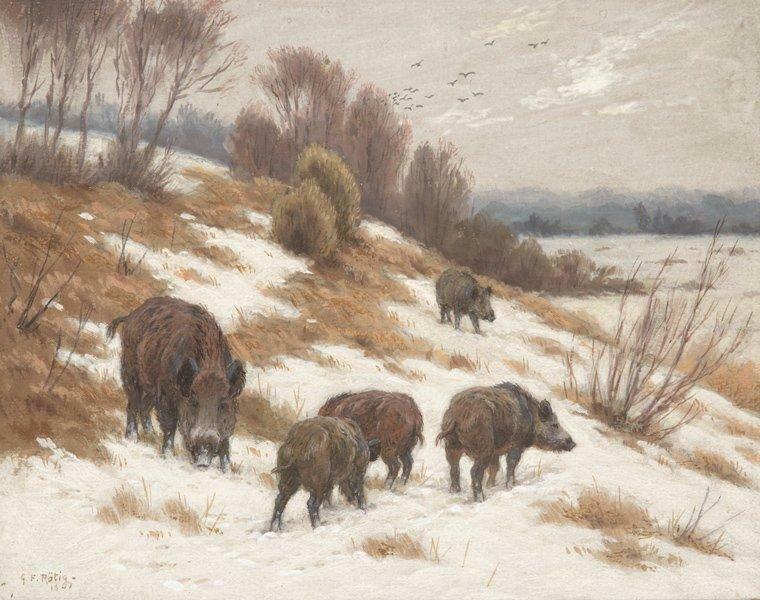 There's a page about him on the website of the National Museum of Wildlife Art in Jackson, Wyoming, which has one of his paintings. 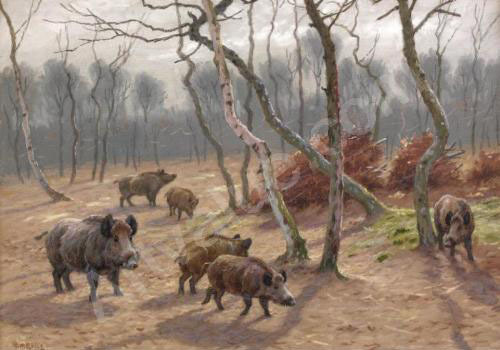 Another great painter of wild boars was the Dutch artist Rien Poortvliet. Another prime example of your statement that various media enhance the learning process and enrich one another. Do you think 19th century painters tried to learn the layering-technique used in oils with less expensive media like gouache? 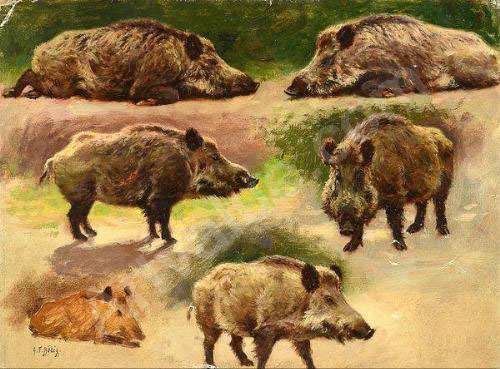 The rather elaborated gouache paintings you publish seem to be so similiarly painted to oil paintings (transparent start getting more opaque etc.). In Germany it was devalued as poster-paint at some time. They were not aware of the possibilities. Gyrus, gouache is not a cheaper alternative for oil. On Amazon, for example, a 37ml tube of ultramarine oil is $12.68. For an equivalent amount of gouache, you would have to pay about twice that much. 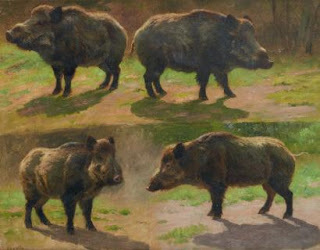 19th century painters would not have used gouache to practice for oils, especially not for layering techniques. Gouache, as you point out, can be started transparently with opaques added later, but it doesn't work for glazing. It's suited to direct, opaque handling without glazes or layers. Some of the best painters in gouache are from France, who have always respected it as a worthy medium for painting. High prices. I did not know about that. Here it is actually rather cheap compared to oils.